To be, or not to be, isn't really a question, it's more like a statement of fact that implies something about the shape of human consciousness. 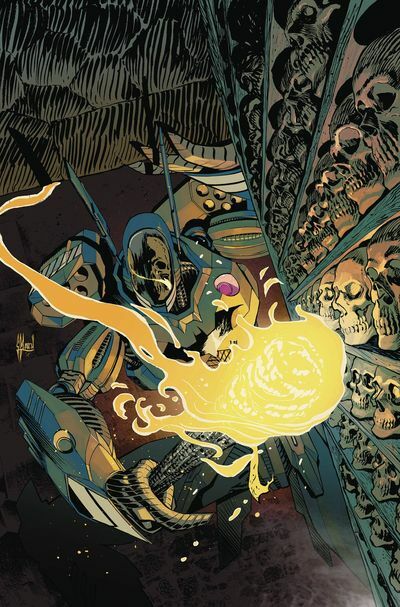 Funnily enough, another statement of fact that implies something about the shape of human consciousness; can be seen in the following comic book created by Peter Tomasi, Fernando Pasarin, and published by DC Comics, in April, 2016. TO QUOTE Someone called Mike: 'Throughout my life I've always looked up to my Mummy. She's always been a lot taller than me'. Years ago, before he became commissioner, Jim Gordon saw a swarm of religious nutters killing a bunch of innocent people while he was out on manoeuvres with the Marines. Now for fairly obvious reasons each of them were duly appalled by this ghastly sight, and accordingly shot them down, deciding to leave things dead and buried. Yet recently these things have become un-buried -- Yep. That's an actual word -- especially since the king of these nutters (some guy called Amun-Set), captures a couple of Jim's old Marine pals and tortures them within his underground domain. Turns out, that by skinning his enemies and wearing their flesh -- insert Lady Gaga joke here -- somehow this'll make Amun as powerful as his ancestors, and, well, that's it really. Prompting Jim and the gang to then rush to the rescue, blah-blah-blah, yawn-yawn-yawn, seen it all before, plop, the end! So yeah, on the whole it's pretty safe to say that I personally wasn't a big fan of this adventure. Where as last months episode was a detective type tale, full of all those detective type goodies like murder, intrigue, and investigations, this month, on the other hand, was one hell of a long winded fight scene between Bat-Jim and his pals and Amun and his. Yeah. Simple as that, really. Case closed. Plus to add insult to injury, the main villain, Un-Set-Jelly (or whatever his name is), was one of the most generic villains I've seen in ages. I mean, let's face it. In the comics we've all seen some mean looking nonce mouthing off with the usual soliloquy about ancestry, revenge, power, as well as the occasional order for x to do y to z. Worse still, their was no explanation given on both his back-story or motivations, apart from the bog-standard 'I want to rule the world' brand of nonsense! Now don't get me wrong, I'm not trying to imply that I didn't like this issue! 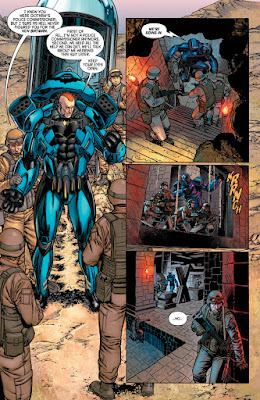 If anything, it was slightly saved by Fernando Pasarin's artwork, who, as always, has managed to keep his version of Bat-Jim more human than others, whilst depicting a fairly staged fight with a modicum of rustic ambience. But then again, that's precisely the problem with stories of this ilk. If you've seen one fight between a hero and an array of non-descript villains, then you've seen them all. Shame -- a bloody shame -- as a part of me would have liked to have seen this creative team bow out on a high note. Yet what's happened instead, coincidentally, is that the last two issues of this series have basically summed it up. From its very beginning this version of Detective has been a strange mixture of good and bad storytelling. When it's good, it's really good (like last issue), and when it's bad, it's really bad (like this one). Thankfully there is a lot more life in the old dog yet, and I'm sure we'll see some of it in the coming months when Rebirth slaps Detective right back to #934. Yahoooo! Viva La Revolution. Viva La Detective. There are two reasons why I'm musically matching up this comic book to the Elvis Presley classic, 'That's Alright (Mama)', and both of them can be found below. 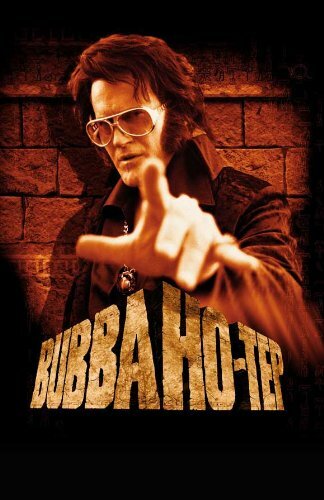 Back in 2002 the king of cheese, Bruce Campbell, starred in an independently produced film called Bubba-Ho-Tep. Now if you've never seen this flick before, then let me just say that it's an alternate-version of Elvis Presley verses a Mummy. No. Not Bruce's Mummy. The Mummy, silly. Just like the one seen in this very issue. Comparison Made. Thang' ya' veri-much. He looks better in a moustache. He loves his daughter like a stalker. He's better at punching than detecting. He isn't a big Superman fan. He works well with others, in spite working largely by himself. He may have a slight crush on Julia -- or visa versa. He's watched the Robocop film yet has since denied it. He's a marine and loves his Mummy.